Police complaint against DU professor Kedar Kumar Mandal of Dayal Singh College in the national capital, Delhi, has been filed by a teachers' body. A Delhi University (DU) assistant professor has been accused of insulting Hindu goddess Durga using obscene words in a Facebook post, which prompted a condemnation from the Akhil Bharatiya Vidyarthi Parishad (ABVP). A teacher's body filed the police complaint against Kedar Kumar Mandal of Dayal Singh College in the national capital, Delhi. The DU professor had posted the controversial Facebook update at 07:43 pm on Friday and later deleted it. The National Democratic Teachers Front (NDTF), a BJP-affiliated teachers' body, filed a complaint against the DU professor Mandal on Saturday at the Lodhi Colony police station. Police said they have received a complaint but are yet to file an FIR. 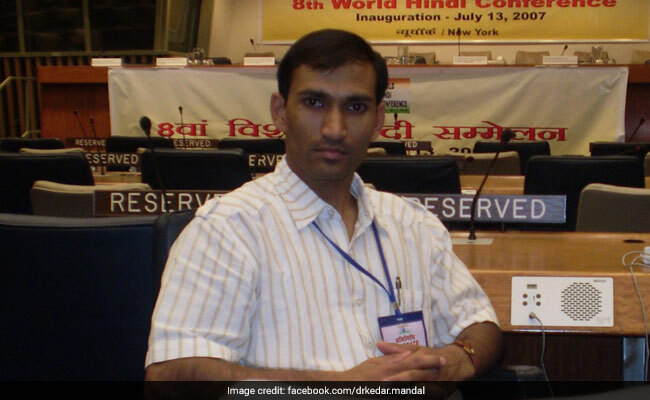 Mr Mandal did not respond to messages and could not be reached on his phone for comments. RSS-affiliated ABVP condemned the post and demanded immediate suspension of the professor.